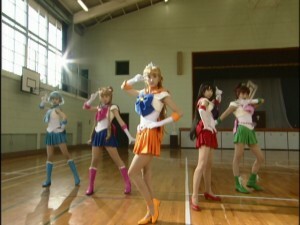 The live action Sailor Moon series sometimes referred to as “Pretty Guardian Sailor Moon” which aired from 2003 to 2004 in Japan. 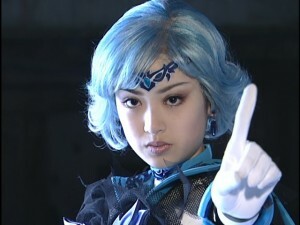 This is a review and discussion of the Live Action Pretty Guardian Sailor Moon series Act 9, I’ll Protect the Legendary Silver Crystal, and Act 10, I am Queen Beryl, Queen of Darkness. 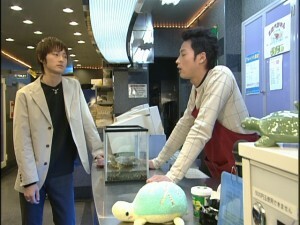 These originally aired on Japanese TV on November 29th and December 6th 2003. 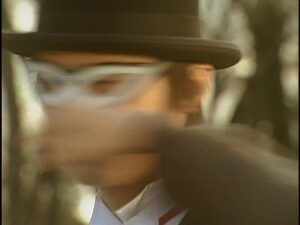 These two episodes follow a story similar the manga Act 6, Tuxedo Mask. In this story in the manga Tuxedo Mask tries to solicit the help of the people of the city in order to find the Crystal, as occurs in Act 9, and then after Zoisite attacks them Sailor Moon heals the people of the city with her Moon stick, which resembles the end of Act 10. Though Act 9 and 10 as Live Action episodes don’t really have much to do with each other they both take elements from this manga story. Act 9 is all about Tuxedo Mask and the hunt for the Silver Crystal! What does this Crystal look like? 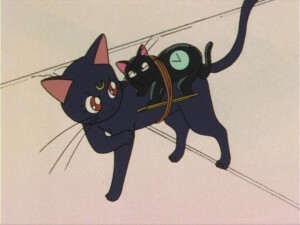 We don’t really know but a couple of depictions in this episode remind of of what it looked like in the original Sailor Moon anime, as opposed to what it looked like in the manga. In the opening scene we see a child looking at a round gem called the Icy Queen that looks like the Crystal in the original anime. 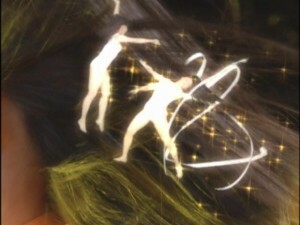 A depiction on television mentions that it would glitter in rainbow colours, and this includes 7 distinct colours shining. 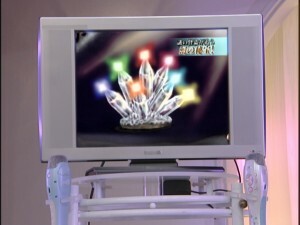 This is reminiscent of the 7 Rainbow Crystals from the original Sailor Moon anime, which were shards of the Silver Crystal which when assembled formed the complete Crystal. 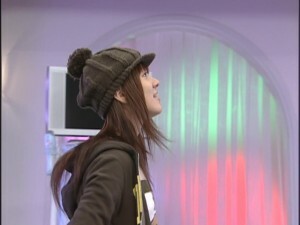 For this episode Minako is off in London to record a new song. 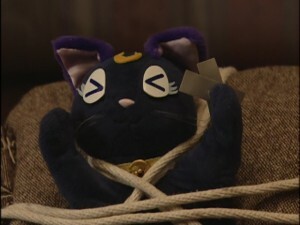 This again reminds us of the original Sailor Moon anime which had Minako spending time in London while she was Sailor V, though it’s unlikely she’s fighting any crime in London as this would be incredibly suspicious, like how Batman always shows up in Metropolis when Bruce Wayne is there for business. This keeps Minako out of the picture for Act 9 and 10, which serves the plot well. We get a bit of an idea as to why Tuxedo Mask is looking for the Crystal! We see a dream of his where the Princess is asking him to find the Crystal. 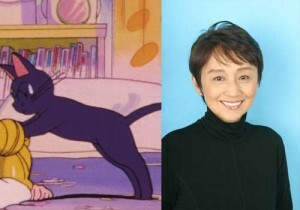 We don’t see any real details of her as her hair style is fairly normal however her voice is closer to that of Miyuu Sawai, who plays Usagi, as opposed to that of Ayaka Komatsu, who plays Sailor V.
In order to try to flush out the Crystal Tuxedo Mask makes a very public statement telling people what to look for and that it’s worth a billion yen, roughy 9 billion US dollars. This is similar to the plot of the manga Act 6, Tuxedo Mask, where Tuxedo Mask does the same. 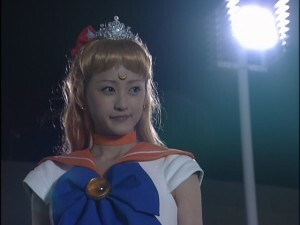 Sailor Moon Crystal Act 6 more specifically based one scene on the live action series. 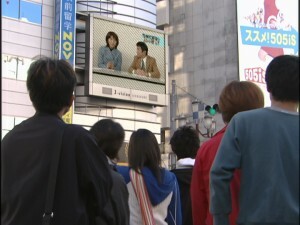 When Zoisite appears on a large TV in the street asking people to find the Crystal this is nearly identical to a scene in this episode where two reporters are asking the viewers to find the Crystal. 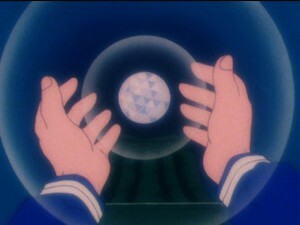 Tuxedo Mask is looking through his coat and sees the handkerchief that Sailor Moon patched his hand with. Odd that this would be in his Tuxedo jacket since he was clearly still wearing it after changing back into his civilian clothes in the last episode! 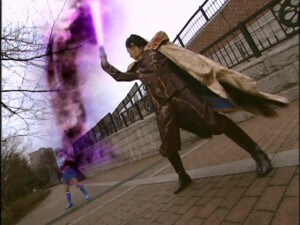 Plot hole or did Mamoru just put it in his jacket after he removed it? Doesn’t this thing go to hammer space like any respectable superhero costume? The gang don’t like Tuxedo Mask one bit! He’s a thief and he’s competing for the Crystal. Rei suggests he may save Sailor Moon as a trick! 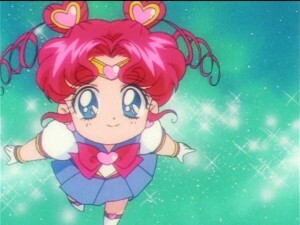 Usagi of course doesn’t want to hear any of this as she’s totally in love with Tuxedo Mask! 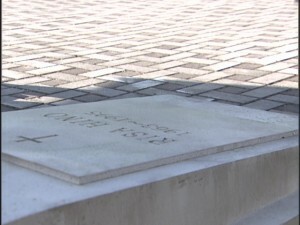 This is the worst kept secret however she is only able to admit it to an empty room! 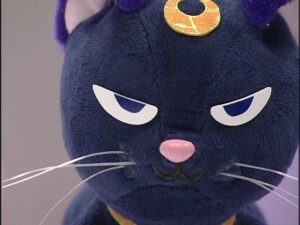 Usagi is conflicted about what to do with Luna and her friends against him on one side but Naru, who only has vague details about the situation, cheering her on from the other. 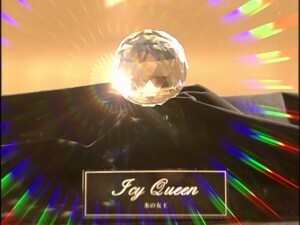 Queen Beryl turns Jadeite into a rock in this episode. It’s probably jade. 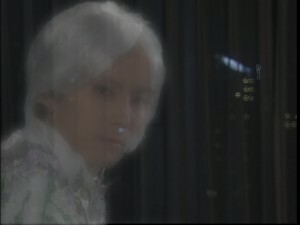 In the manga when a Shitennou gets turned into a gem they’re essentially dead only returning as ghosts to talk to Mamoru, but this is not the last we will see of Jadeite! As the city is furiously looking for the Crystal a rich man, Masanobu Narita, believes he’s found it and wants to hire Rei to protect it for him! Rei, not being hired to appear at this episode’s location shoots, isn’t interested at all and so Ami volunteers to go on her behalf, posing as her top apprentice, a fellow Shinto Priestess. She keeps doing this weird thing with her glasses which makes them squeak. A tick that she gave her fictional character which doesn’t actually do anything? It’s kind of odd. 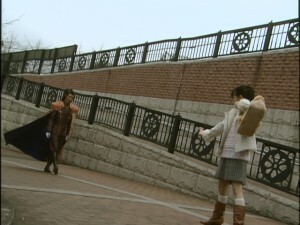 Usagi and Makoto come along to help Ami and transform. 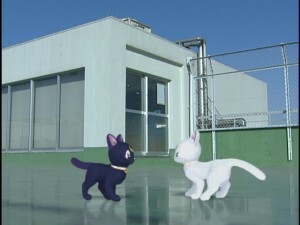 Makoto becomes a police officer and Usagi a worker who is trimming trees. 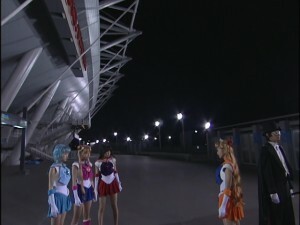 When a ton of Tuxedo Masks show up though, Usagi thinks she sees the real one! 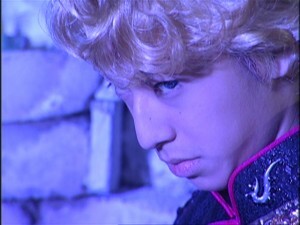 Why, I wonder, is everyone dressing up as Tuxedo Mask? They want the Crystal, sure, but does this incredibly conspicuous costume help anyone? What’s one more Tuxedo Mask? 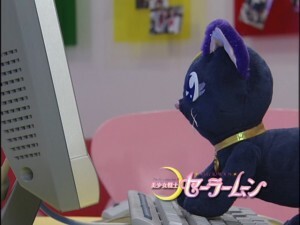 Usagi uses her phone to make herself dressed as Tuxedo Mask in order to distract the real police from who she thinks is the real Tuxedo Mask. 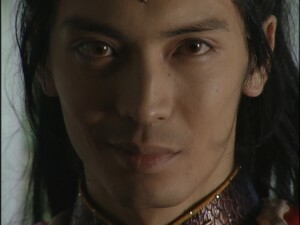 He turns out to be a weird kind of pervert who gets off on touching Usagi’s wrist which is a very odd form of intimacy. When Tuxedo Mask Usagi gets cornered the real Tuxedo Mask tells her to transform! How does this help the situation at all? We don’t know. 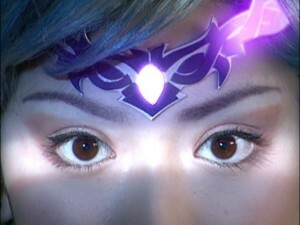 She transforms, we see her stock footage, and then the problem is somehow resolved! There’s no scene of her escaping or anything, she just transforms and we don’t deal with that problem anymore. 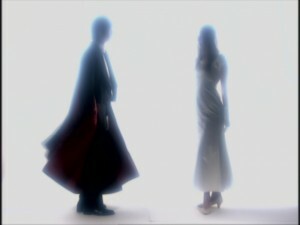 Tuxedo Mask and Sailor Moon have a little heart to heart. She expresses that she wants to know who he is but he doesn’t want to share. Meanwhile the supposed Silver Crystal is so fake that it breaks from being dropped. This means it’s what, made of glass? It looks like something that would hang off of a cheap chandelier. 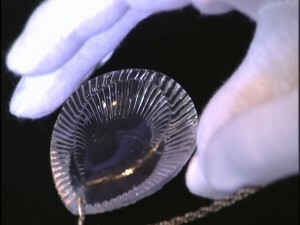 The gem was appraised as having qualities similar to the Silver Crystal yet… it just breaks when it’s dropped? Very lame! What do these people do to test them? Does Tuxedo Mask really need to steal all of these to find out if they’re legit? Does he look at it with one of those little monocle microscope thingeys or can he just sense it after having illegally repossessed it and held it a bit? Act 10 is all about the story of Princess Kaguya, known in Japan as The Tale of the Bamboo Cutter. It’s difficult for a North American viewer to completely appreciate the episode without having the expected understanding of The Tale of the Bamboo Cutter that most Japanese children would have. 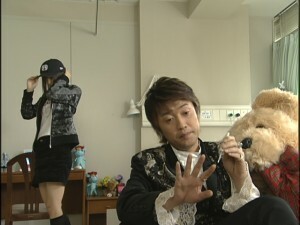 Just another example of why this show is not very accessible outside of Japan. This story is well known in Japan and was recently adapted as a 2013 Studio Ghibli film The Tale of the Princess Kaguya. I would recommend checking out the film which presents a fairly straightforward adaptation of this ancient tale as it is something that is referenced frequently in Sailor Moon. As we learn in this episode it is the story of a young girl who is born from a bamboo shoot and raised by her adoptive parents until she finally learns that she is from a Kingdom on the Moon and must return home. Sound familiar? There are certainly a lot of parallels to Usagi’s story as told in the original manga and anime, as she is a Princess who originally comes from a Kingdom the Moon and was reincarnated on Earth to finally return to the Moon to meet her real mother. It seems likely that the Tale of the Bamboo Cutter served as some inspiration for the story of Sailor Moon. 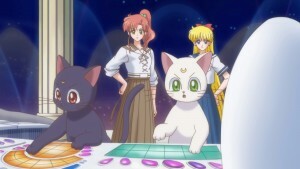 In addition to this episode The Tale of the Bamboo Cutter is related to the manga side story The Lover of Princess Kaguya, which was adapted as the Sailor Moon S movie. The film itself doesn’t actually have much to do with the story. 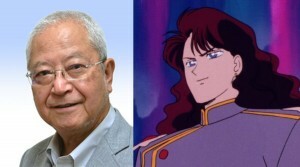 Kakeru, the man who Luna falls in love with, is a romantic who believes in the legend of Princess Kaguya and who, despite being a brilliant astronomer, believes that what he sees in space relates to such magical things. When Luna finally takes human form in the story she identifies with Princess Kaguya but her character or journey in the story doesn’t have much to do with Princess Kaguya beyond the superficial fact that she’s going to space. The villain of this story Princess Snow Kaguya also doesn’t have much in common with the Princess Kaguya from the Tale of the Bamboo Cutter. 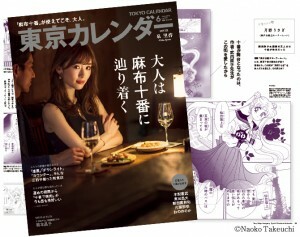 Kakeru’s girlfriend Himeko, who based on the title would be the lover of Kakeru, who is Princess Kaguya’s lover, also doesn’t have much in common with Princess Kaguya, aside from the fact that she goes to space. 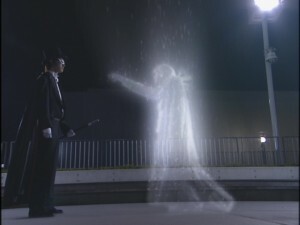 This episode has Rei dealing with the loss of her mother. 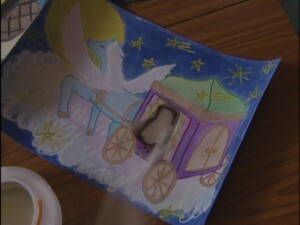 In the opening scene we see her at the hospital shortly after her mother died, with a children’s story book about Princess Kaguya left on her mother’s bed. 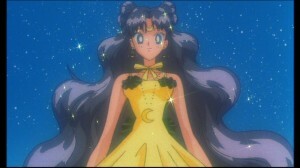 This leads into a unique transition to the opening credits as Rei stares at the Moon as it leads into the opening. Rei believed, and still seems to believe to some extent, that her mother is still alive on the Moon, like Princess Kaguya from the story which her mother frequently read to her as a child. 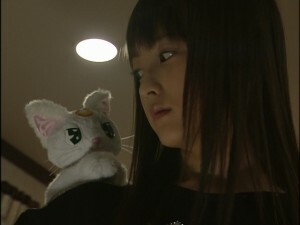 She befriends a young girl, Erika, who also believes that her recently deceased mother is still living on the Moon. The two are working on a picture story of The Tale of the Bamboo Cutter, with Erika and Rei working on the final page where Princess Kaguya leaves for the Moon on her chariot. Young Rei, as seen in this episode, is not the same young Rei we will be seeing in the future! While Rei is sad about her mother dying Usagi has a really pointless argument with her own mother about whether or not to put cheese on her omelette. She tries to run away first to Crown Karaoke, then to Naru’s, then to Ami’s, then to Makoto’s and finally, as a last resort, to see Rei at her shrine. When she shows up Rei asks if Usagi had a fight with her parents, which is humorous since Usagi’s father is as unseen in this series as Princess Serenity’s father! Rei is happy to let Usagi stay there for a while, which doesn’t even end up being overnight, though when Usagi realizes that Rei’s mother is dead she feels particularly bad about her comparatively silly problem! Zoisite, meanwhile, is working on his latest song! This one creates a monster which sings and makes any Princess, be it an image, a person, or someone who just sort of feels like a Princess, burn up! This causes all sorts of non Princesses to have problems and seems to cause few problems to the actual Princesses we care about! 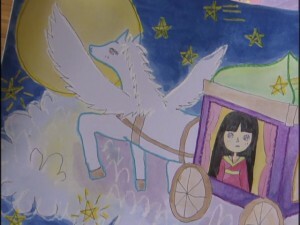 The image of Princess Kaguya that Rei and Erika are working on lights on fire. So does a young girl’s doll. Erika, who thinks of herself as Princess Kaguya because of her thing with her mom, gets a fever, which is convenient since it would have been really extreme if she just spontaneously combusted. 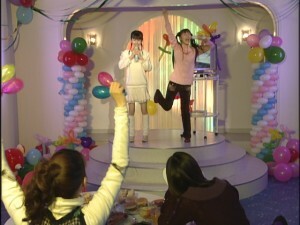 There’s also an actual Princess who falls ill on TV, which is how Makoto knows something is up. Who isn’t affected by this? 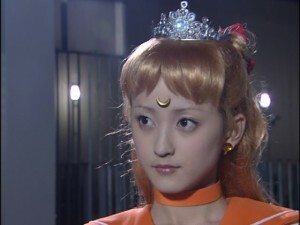 Minako, who we are meant to believe is the Princess, who is away in London supposedly out of Zoisite’s range. 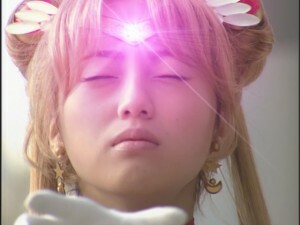 Usagi isn’t affected. 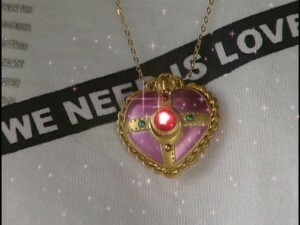 This could either mean that people who are Princesses but don’t know it aren’t affect or that Sailor Moon is not Princess Serenity in this continuity, as some fans legitimately believed at this point in the series and I’ll never let them forget it. Ami is at the library and she sees a Princess from a young girl’s story book catch fire. The other notable thing about the library? 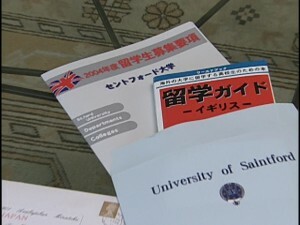 Makoto’s “Sempai” is there! 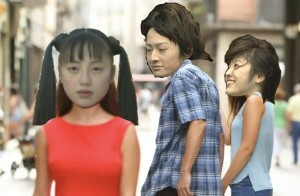 Back in Act 6 we learned that Makoto left her old school after having an unrequited love for a student in another grade, frequently referred to as her “Sempai”. 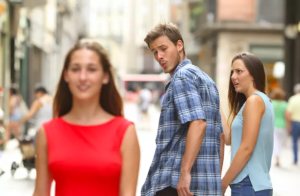 When we see her flashback about people leaving, such as her parents, the last person we see leave is the person who I assume is this older boy who she was in love with. 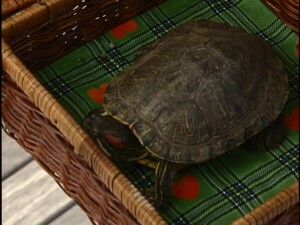 This guy is in the library! We are made to believe that Makoto moved and changed schools to get away from this guy. 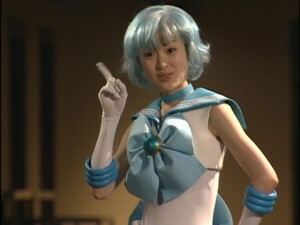 Did Ami go to a really far away school? 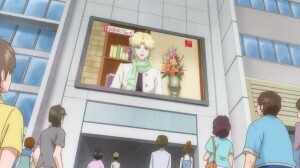 Did this guy go to a far away library that she thought might have a book with information helping her to find Sailor V? Did they just reuse an extra and not expect some overly analytical fan to notice some 14 years later? So the gang fights the monster by dancing to dodge her musical notes and it’s all silly. Finally Sailor Moon uses her Moon Stick to heal everyone, real or paper, who has been negatively affected by this weird thing which attacks anyone who isn’t a Princess. 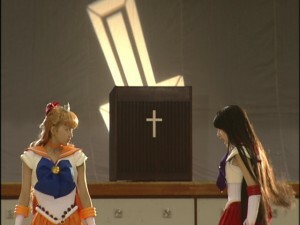 This is similar to the end of Act 6 of the manga where Sailor Moon uses her Moon Stick to resurrect the people of Tokyo, though not much else from this episode resembles that story. The gang are then confronted by Queen Beryl who gives them a bit of information about their past which Luna was hesitant to share. She tells them that they all come from the Moon! What a shocker! Later at the Princess Kaguya picture show Usagi breaks down crying due to the fact that her birth mother may not actually be her mother! This is something I’ve mentioned in the past as a potentially confusing plot point of the series. Unlike Princess Kaguya these girls were born from the wombs of their Earth mothers, not cut out of a bamboo shoot. 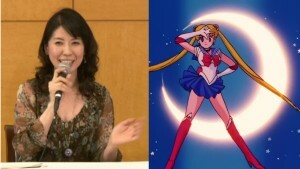 Is Usagi Tsukino genetically identical to Princess Serenity of Silver Millennium? If so, does she actually share any genes with her mother and father who live in present day Tokyo as most human children do or was there a magical cloning or embryo implantation done at conception? Does she share roughly 1/2 of her genes with her brother Shingo who was also born from those parents? 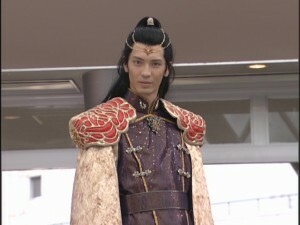 Does he have a Silver Millennium equivalent that he’s reincarnated from? 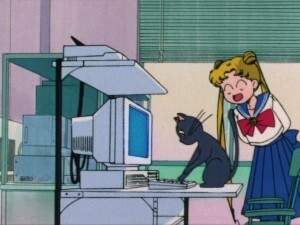 If not, is it actually creepy when Shingo has a crush on Sailor Moon in the original Sailor Moon anime if they don’t actually have any genetic similarities? This very significant and meaningful observation by Usagi, which is mostly ignored by her friends who are in a similar situation, is atypical for her to catch on to. Shouldn’t Ami, the genius child of a doctor mother who’s career path she aspires to follow in, be wondering where her intelligence comes from if it’s not inherited? Shouldn’t Rei, who hates her father, be glad to be potentially the genetic equivalent to being adopted by him through magical reincarnation? What link does she have to her mother who she misses? 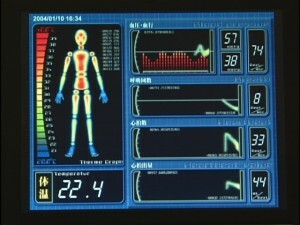 Regardless of genes she may have she was still raised in her womb as that prenatal environment affects her development. She seems to have some concern about some aspect of this as she’s also brought to tears by the sentiment. Should Makoto be pleased at the prospect of having parents on the Moon or are they also dead? Will we ever get answers to any of these questions? No we really don’t. Queen Serenity or any other inhabitants of Silver Millennium aren’t really seen in this series, not that we’d likely get answers to such specifics questions if they were. 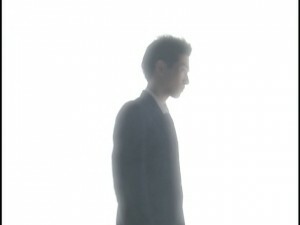 In the final scene Minako, who’s been away in London for the past two episodes, arrives back in Tokyo. Zoisite plays his song which instead of directly attacking her seems to be controlling the driver of a truck which is swerving towards her! End of episode! Cliffhanger! 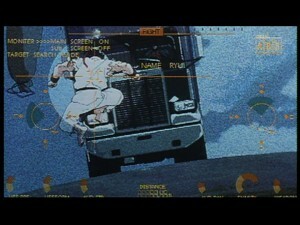 This is almost identical to the final scene from the fantastic Street Fighter II animated movie which has Bison trying to run a truck into Ryu! Coincidence? Certainly!